Ireland has the 3rd largest gap to close in relation to its share of renewable energy in gross final energy consumption in the EU by 2020. Failure to comply by 2020 will result in fines at EU level and lead to a more arduous trajectory in the context of (yet to be defined) post-2020 targets. What are the 2020 Targets? • 20% of EU energy to come from renewables. This note examines progress towards the 20% renewable energy target. The 2020 energy efficiency target requires a 20% reduction in final energy demand based on the average energy demand during the period 2001 to 2005. Savings to date have been achieved through a number of measures including improved building regulations, energy management in large industrial installations, more efficient vehicles on Ireland’s roads, electricity system efficiencies, and the retrofitting of existing buildings. As a result, over €700 million has been saved in reduced energy bills for businesses and householders. In 2015, Ireland achieved a 9.2% share for renewable energy. Thus, Ireland is 6.8pp away from its 2020 target of 16%. Ireland has the third largest gap to bridge (the same as the UK), after the Netherlands (8.2pp) and France (7.8pp). See figure 1. • renewable energy in transport (10%). Electricity is the smallest sector in terms of demand, and therefore the 40% electricity target contributes proportionately less to the overall renewable energy target than do the lower (percentage) targets for renewable energy in the heat and transport sectors. Ireland’s percentage point increase from 2006 to 2015 in the share of renewable energy in electricity is the 7th highest in the EU. See table 1. The target for the electricity sector is 40 per cent. As of the end of 2016, about 70% of the wind energy connection target for 2020 had been achieved2 on electricity increased by 23 per cent to €401m from October 2016 to September 2017. The megawatts of renewables supported in 2016/2017 will increase by a third. The amount of renewables connected to the electricity network exceeded 3,200 MW in 20164 . In 2015, the percentage share of renewables in electricity reached 25.2%. This was 2.6 pp below the EU28 average (28.8%). Ireland is currently on track to achieving the national target of providing 40% of its electricity needs from renewable resources by 2020. The transport sector is currently the largest energy-using sector and is the sector most reliant on imported fossil fuels. The share of renewable energy in the transport sector reached 6.5% in 2015 in Ireland – just 3.5pp short of the 10% target for 2020. 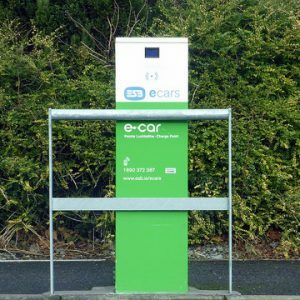 Every year in Ireland, passenger cars travel an average of 500 km using biofuel that has been created by blending regular petrol and diesel with biofuel. Supply of between 440 – 500 million litres of biofuels must be secured for blending with fossil fuels for transport, in order to increase the biofuel consumption level to 8% by 2020. In 2014, 167 million litres of biofuels were used for transport. To achieve our target, roll-out of electric vehicles must be greatly accelerated –within five years electric cars must account for 20% of all new cars sold in Ireland. In 2016, 2.2% of new private cars licensed were electric/electric hybrid (3,182). A Low Emissions Vehicles (LEV) Task Force has been established to present a range of options to the Government that will assist in accelerating the deployment of LEVs in Ireland5 . The share of renewable energy for heating and cooling reached 6.4% in 2015 – just over half the target or 5.6pp short of the 12% target for 2020. Estimates by the Sustainable Energy Authority of Ireland suggest that under present policies this target will not be met. The shortfall “could be in the region of 2 to 2.5 percentage points of the 12% target. This represents about 1 percentage point of the overall national target of 16%”. The gap to achieving the target is equivalent to about 300,000 homes, 3,000 services/public sector buildings or 200 large industrial sites installing a renewable heating technology – or a mix of installations across each sector. Improving energy efficiency greatly assists meeting the heat target. Currently – over 40,000 homes and over 550 businesses use some source of renewable energy for heat. While considerable progress has been made, much remains to be done particularly in the heating and transport sectors. 3 The Public Service Obligation Levy is a government subsidy that is charged to all electricity customers in Ireland. The money collected from the PSO Levy is used partly to subsidise renewable energy generation. 4 A total of 540 MW of renewables was connected in 2016, bringing total renewable MW connected to the grid to over 3,200 MW. ESB Networks plan to continue to connect a further 800 MW of renewable energy in 2017. 5 Since the introduction of the EV Grant Scheme in 2011 to the end of 2016, the purchase of 1,702 new electric vehicles has been supported.